Each year families and busloads of school children visit Coldstream Creek Park to view the spawning kokanee up close and personal. 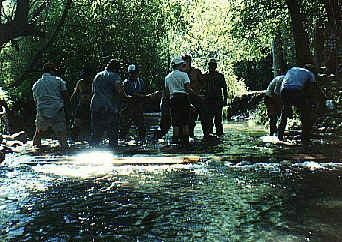 Since 1989, Kalamalka Flyfishers has maintained and improved the creek’s spawning habitat. The first year, we placed four wooden weirs in the creek, improved 700 sq. meters of stream bed, stabilized 115 metres of stream bank and upgraded 50 metres of roadway. That project involved movement of one hundred and eighty metric tones of debris, crushed gravel, drain rock and boulders. 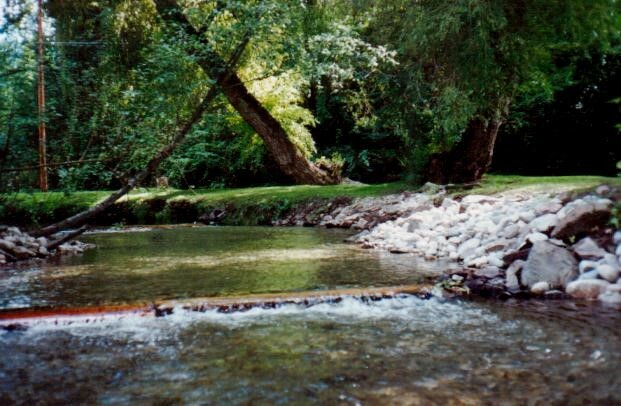 In 1990, the club added 3 more weirs, two new spawning platforms and 200 metres of the stream bed “rip rapped” with boulders to minimize erosion. In the intervening years, Kalamalka Flyfishers has regularly added more weirs and gravel, cleaned spawning gravel and maintained the quality spawning habitat. Over the years, KFF members have twice undertaken major signage projects. There have been directional signs to lakes and more importantly, signs detailing fishing restrictions for “special” lakes: things like “fly only”, retention size restrictions and motor restrictions. The latest sign project targeted Aberdeen Plateau lakes with some forty signs. Some are still visible, but these signs have a limited life as they are destroyed by various man made and natural means. 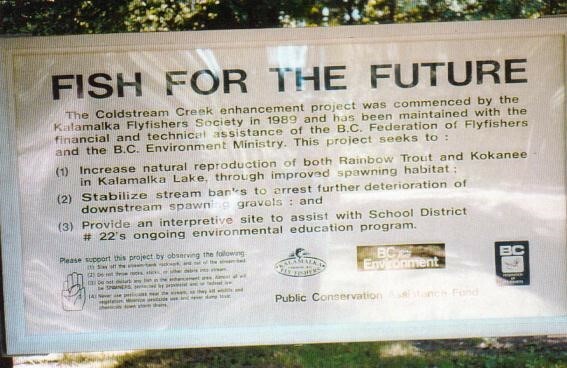 In the mid-1990’s, there was a joint effort between the Federal Fisheries, the Shuswap Hatchery, First Nations and our Club. For two years, about 300 spawning Chinook salmon were caught (each year) and transported to spawning beds 5 km above Shuswap Falls. Here they were tagged and released into the river. Fry traps were installed above and below Wilsey Dam to monitor fry production and migration. The results would provide valuable data on the feasibility of building a fish ladder around the the dam. A winter test fishery was taken on by The Kalamalka Flyfishers on the middle Shuswap with the permission of the MOE (the river was closed to all public fishing). Permits were issued to the Kalamalka Fly Fishers for two consecutive winter seasons to catch, record and release any fish caught. As a result of this exercise, the river was opened to winter fishing for White Fish the following year. During this fishery, different styles of barbless hooks were also analyzed with regard to fish mortality rates. Over the years Kalamalka Flyfishers installed outhouses near a few lakes. This of course involved digging a pit and then constructing the outhouse to place over that pit. These buildings met various demises and no longer exist. Today’s environmental requirements make it impractical for KFF to undertake such projects.